Are you tired of winter yet? Of snow and ice and windy weather and of not having ripe juicy tomatoes for salads? I certainly am. But the other day, I managed to make a suprisingly refreshing and delicious winter salad that at least temporarily made me stop complaining about winter. When we went to the green market recently I noticed many strange looking roots, that I’d never cooked with, and probably never eaten too. One of them was this funny looking thing below, which after googling root veggies, I found out is called a rutabaga, or a swede or a yellow turnip. As you can see from the photo above, we came home and put the funny rutabaga away and forgot about it. After about a week, the skin had started to get a bit wrinkled but I still went ahead and decided to make a winter salad with it. Once I peeled it, it looked perfectly firm and fine. I cut it in thick slices and then dice, rubbed some olive oil and roasted it. When roasted the rutabaga had an unsual, slightly sweet and very pleasant taste. Give it a try… I think you’ll like it. Wash, peel and dice the rutabaga. Rub with a tablespoon of olive oil, sprinkle salt on it and roast in a pre-heated oven (220 C) for about 30 min. Mine took longer, about 45 min. as my oven is not very strong. You will know when the rutabaga is done when the dice is soft and browned on the outside. Put aside to cool slightly. Mix all the ingredients for the dressing. Put the greens in a bowl and pour dressing over them. 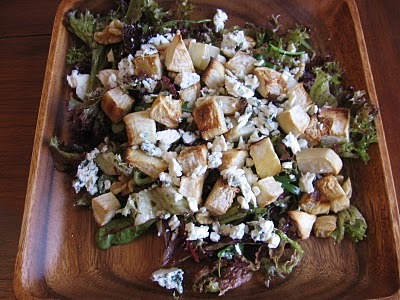 Mix well, then add the walnuts, crumbled blue cheese and rutabaga cubes to the greens. Enjoy ! Интересна зимска салата со репка – корен кој до сега не сум го пробала, а кој има сладок и одличен вкус. Пробајте ја ! Измијте ја репката, излупете ја и исечете ја на коцки. Намачкајте ја со маслиново масло и посолете ја, и ставете ја да се пече во загрена рерна на 220 Ц степени окол половина час. Мојата рерна не е многу јака, па ја печев околу 45 мин. Репката е готова кога ке биде омекната и заруменета. Извадете ја од рерната и оставете ја да се олади. Измешајте ги состојките за преливот и со него измешајте ја зелената салата. Врз салата ставете ги оревите, плавото сирење и коцките репка и уживајте !